Often referred to as the “Queen of the Blues”, Dinah Washington was one of the most celebrated singers of the mid-20th century. With her distinctive high-pitched and sultry gospel-influenced vocals, Washington worked across almost every genre of popular music, including gospel, blues, jazz, classic pop and R&B. A true inspiration and influence to generations of singers from diverse genres, she had a troubled personal history. Born “Ruth Lee Jones” in Tuscaloosa, Alabama in 1924, she was raised in Chicago, Illinois. Washington developed an early interest in music and started singing and playing piano for the choir in St. Luke’s Baptist Church. While still in her teens, she became a member of the Sallie Martin Gospel Singers and won a singing contest at Chicago’s Regal Theater, where she performed “I Can’t Face the Music”. Dinah Washington then started performing in Chicago’s finest nightclubs where music critics and talent managers recognized her talents and introduced her to renowned jazz bandleader Lionel Hampton. She worked as a vocalist in Hampton’s band for the next three years. During that period, two of her recordings for jazz composer Leonard Feather – “Salty Papa Blues” and “Blow Top” – became big hits. Washington secured a recording contract with Mercury Records in 1946. In the following years, she released a string of chart-topping hits with the label, such as “Embraceable You”, “I Can’t Get Started”, and “The Man I Love”. Her youthful, high-spirited singing voice was noted for its clear diction, gospel-inspired intensity, and near-perfect phrasing of the melody. Washington demonstrated her talent to a vast audience by recording with high-profile studio ensembles and instrumental soloists. Her records sold very well until the 1950’s rock ‘n’ roll explosion. Washington collaborated with rock arranger Belford Hendricks, recording her biggest hit “What a Difference a Day Makes”, which brought her tremendous crossover success. Influenced by Billie Holiday and Bessie Smith, she shaped a unique connection between gospel and jazz vocal styles that made her one of the greatest and most influential singers in history. Washington died during the height of her career in 1963, at the young age of 39. She is buried in the Burr Oak Cemetery in Alsip, Illinois. 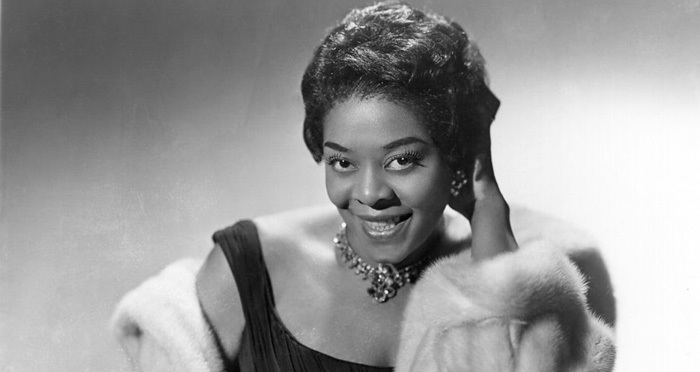 Dinah Washington earned numerous awards and accolades in her lifetime, and has been posthumously awarded many more. A few of them include a Grammy Award for Best Rhythm & Blues Performance (1959) and 3 Grammy Hall of Fame Awards (1954, 1959 and 1959). She has been inducted into the Alabama Jazz Hall of Fame (1986), and into the Rock and Roll Hall of Fame (1993). Dinah Washington was married eight times in her short life, and seven times divorced. She had two sons, Robert Grayson and George Kenneth Jenkins.